But, if you have been following me for the past fifteen years–whether through my blogs, newsletters, seminars or webinars–you know I’ve said this already. And I didn’t need to survey 75,000 customers like HBR did. I have long said that exceptional customer service is ‘necessary evil’–we have to do it, if we don’t our competition will. But there are three problems with exceptional service that makes it an evil. First, exceptional service is easily duplicated by the competition. If I’m your competitor and I hear about or witness a service you are providing, that I’m not, can I copy you? Sure I can. And now copying our competition is easier than ever, all I have to do is go to your website and surf around. And, an unexpected problem from being duplicated is that we are constantly raising our own bar. What are the services you are providing that your competition can easily duplicate? Second, exceptional customer service can be expensive. Too many times companies feel they have to ‘giveaway’ products or services to make the customer whole. In truth, if we handle the issue quickly the customer will return with future business for us. We must remember to address the intellectual needs of the customer by fixing the problem and then their emotional needs by saying we’re sorry. Third, exceptional service has a perception problem. I may perceive the service you provided for me as excellent but someone else may disagree. Or maybe I define great service as a knowledgeable service provider. But you think great service is a clean environment. If you focus your energies on one and not the other, someone is going to be disappointed. Try as we may, we can’t ‘reach’ everyone. We are always going to have critics, so why spend time and money on something that has a high percentage of missing the target? Quality customer service is the avenue to follow when considering where to put your energy to keep the customers you have. If you would like to know the difference, send me an email for a gift of my 25 minute webinar recording giving you the details. The “7 Slight Edges” the seemingly little things that make a big difference in the level of service you provide. These are from my 25 years of experience working with companies that are great at keeping their customers. Big Picture Thinking; Companies that deliver great service know ‘why’ they deliver great service. They know and understand what’s in it for them, for the customer, and for their employees. Companies that see the Big Picture demonstrate a long term thinking process. Courage; Companies that deliver great service have courage. They take action on their ideas to deliver great service. They aren’t afraid to try new and different things to show customers they are important to them. Sometimes there are barriers that keep us from going forward and many times these barriers are self-imposed. 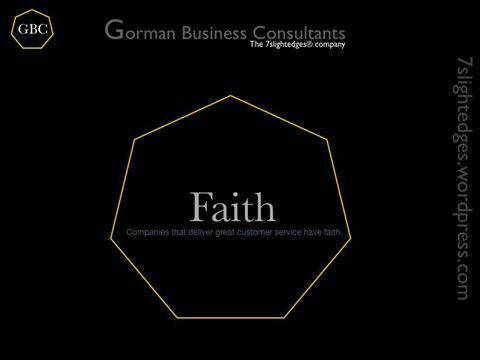 Faith; Delivering great service means having faith. Faith is belief in something we have no proof of. We may think that standing up and shaking our customers’ hand will bring them back but, we really don’t have proof they come back because of that greeting. But, companies that deliver great service know that it does, they have faith. Effort; To deliver great service, companies must make delivering great service the center of daily operations. It’s the first thing on their mind, not the second thing. Companies that excel in delivering great service make it their top priority. Economics; Economics is the skill of earning more money than you spend. It’s difficult to deliver great service if your focus is on, not the customer but, the upcoming lease payment you’re going to have trouble making. Be of Service; What does Harley Davidson make? Motorcycles, right? What does Harley Davidson sell? If you said things like, the open road, a ‘made in America’ image, or a bad boy style, you would be right again. Companies that excel in delivering great service don’t talk about what their products and services are, they talk about what they do, how they serve. I’m excited to announce two new webinar recordings are available for roll out. “7 Slight Edges to Keeping Your Customers” and “Leading Service Teams, Coaching the 7 Slight Edges” have been wildly popular. I have led these workshops on a global level and now I’m putting them into a video format. For $299.00 you will receive 12 downloadable installments of videos throughout 2014. Each recording has unlimited usage—train one employee or one thousand. I will lead your team through the participant workbook complete with exercises, insights and applications. “7 Slight Edges to Keeping Your Customers” will empower all employees that they are capable of creating a customer for the company. “Leading Service Teams, Coaching the 7 Slight Edges” will give your leaders the skills to coach the ‘7 Slight Edges’ so employees are engaged in delivering quality customer service to retain more customers. Call or reply to me today. Sign up to start receiving your videos in January. Make 2014 the year you engage your employees, keep your customers and grow your revenues. Companies that deliver great customer service make delivering great service the center of daily operations. Not the second thing on their list of things to do. Not a ‘good idea’ of many other good ideas–the center of daily operations. Effort is about time management, the best use of your time. Companies that deliver great service knows what matters least should never come before what matters most. Because there are so many levels to Effort; coaching, planning, feedback, it would be difficult to cover all aspects in this blog. When clients ask me where they should put their “Effort” first, I say into Quality Customer Service. Quality Customer Service, when understood and applied, will have an immediate, positive impact on the level of service you provide your current and future customers. When you take one of my workshops you will notice all of them have the word ‘Quality’ customer service and not ‘Exceptional’ customer service in the titles. What’s the difference? Some participants says one is higher than the other, then there is disagreement on which is higher. Some say exceptional is what expected and quality is the best. Some say that quality is the minimum. Here’s what I teach in my sessions, follow this common example. Ford builds the cars, and they sell the cars to the dealers who in turn sell them to us, the customer. Now let’s say you’re driving along in your great new Ford and you realize the brakes are in need of repair. So you take the car back to the dealer, they fix it and give it back to you. If they do this for a reasonable price and say thank you they delivered customer service, no more, no less. Now let’s say they fix the car in two hours, and they do it for a reasonable price. And before they return the car to you, they wash it and fill the tank with gasoline. What, besides dreamland, would that be? I’m sure most of you are thinking that would be exceptional service, and you’d be right. What makes something exceptional is that the customer can touch it, see it, it’s real. Exceptional service is in the face of the customer. For this to be a “Quality” customer service experience, the dealer needs to go back to Ford and tell them they’re building cars with bad brakes, stop doing that. The key aspect of “Quality” is prevention; we are preventing this from happening again. Remember, it’s not the mistakes we make that define us, it’s the mistakes we repeat. Companies that have the reputation of delivering poor service repeat the same mistakes, check-out lines are always long and slow, ringing telephones are left unanswered, there’s always a delay at the clinic, and the wait staff is always annoyed. Put your effort into quality customer service. Engage your staff on how to make an unhappy customer whole again using exceptional service. And how to communicate the problem so effort can be taken to make sure they are not repeated.